In 2018, the University of Sydney found that the healthcare sector contributes 7% of Australia’s carbon footprint and this soars to 10% in the USA (Davey, 2018). International networks such as Healthcare Without Harm, the Climate and Health Alliance and Global Green and Healthy Hospitals (GGHH) are advocating the change to more sustainable healthcare provision across the globe as healthcare providers aim to meet community expectations and consumer preference for responsible facilities. This becomes even more important as climate change threatens health and healthcare functions. Burnside Hospital has joined a global shift to ‘green’ healthcare by adding a solar power network, energy efficient fixtures and increasing recycling programs to ensure sustainability and energy efficiency into the future. 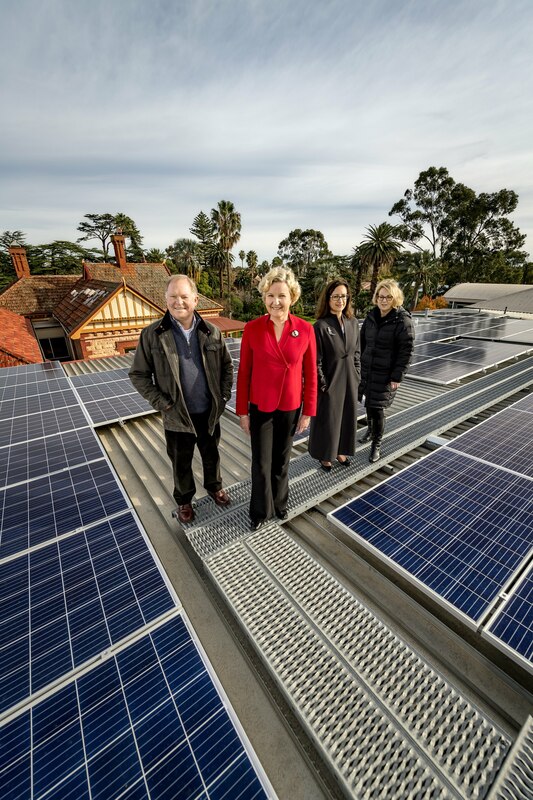 Over 500 solar panels were installed on the Hospital’s Toorak Gardens rooftops through May 2018 and the switch to solar power wraps up a host of greening initiatives at the Hospital. The solar network is generating 157kW of power which will supply 12% of the annual energy needs of the Hospital. 1,032 interior lights were replaced with LED fittings in the same month, including across the operating theatres, support service areas and in all patient rooms. The result is a softer and more natural ‘daylight’ type lighting for patients and staff, which is particularly welcomed by bed-ridden patients or those staying multiple days. 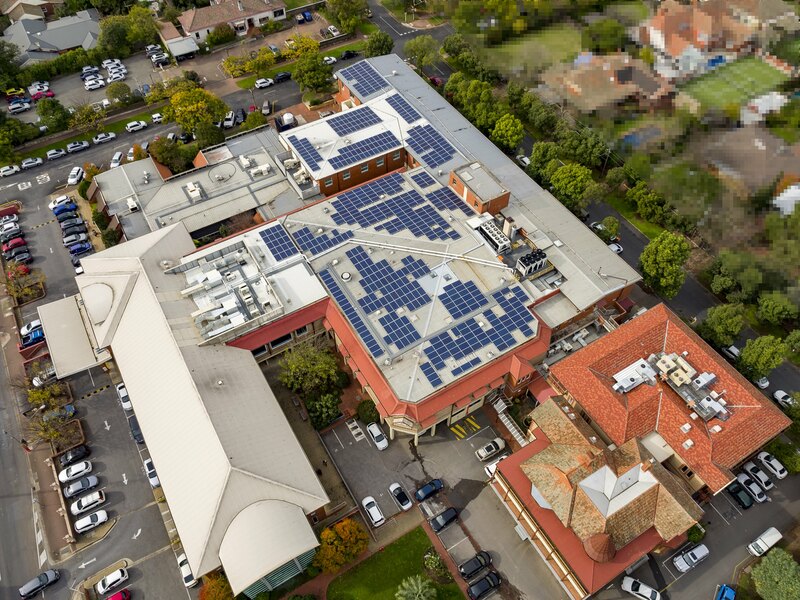 These two combined initiatives will save 253 tonnes of CO2 annually (the equivalent of removing 131 cars off the road each year) and reduces the energy bill of the Hospital by up to $140,000 p.a. Installation of power factor correction equipment to improve power quality (reducing our real electricity demand) was also part of the project. The solar and lighting projects also follow a successful recycling program implemented in the Perioperative Suite. The benefits of the program not only reduce our waste, but also cut our operational costs and enhance the Hospital’s environmental standing in our community. While the usual items have been on the recycling program for many years, an internal committee reviewed the waste management operation and included Kimguard (sterile wrap) and hard plastics into the recycling stream in the past few years. These new measures have been implemented through the Perioperative Suite, including CSSD, and have resulted in overall waste reduction across the Hospital. There is more to be done in this area and an internal Environmental Interest Group has recently been initiated by Hospital staff to continually improve sustainability practices and reduce the Hospital’s impact on the environment. The next focus areas are water and energy conservation while also contributing to the engagement and involvement of our wider team, visiting specialists and patients. The combined efforts of the Hospital to reduce its carbon footprint are in sync with a global trend for greening healthcare facilities to create a better and healthier environment for patients and our community.